The mobility of your pet's joints has a dramatic effect on their quality of life, from being able to go on walks to simply having a comfortable night's sleep. 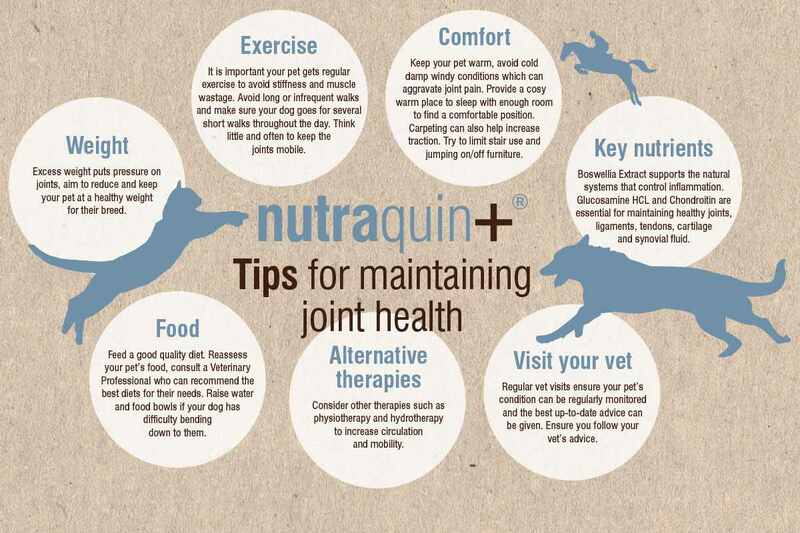 Here are some tips on how to help maintain joint health for your pet. Weight - excess weight puts pressure on joints, aim to reduce weight and keep your pet at a healthy weight for their breed. Exercise - it is important your pet gets regular exercise to avoid stiffness and muscle wastage. Avoid long or infrequent walks and make sure your dog goes for several, short walks throughout the day. Think little and often to keep the joints mobile. Food - feed your pet a good quality diet. Reassess your pet's food, consult a veterinary professional who can recommend the best diet for their needs. Raise water and food bowls if your dog has difficulty bending down to them. Comfort – keep your pet warm, avoid cold damp windy conditions which can aggravate joint pain. Provide a cosy warm place to sleep with enough room to find a comfortable position to sleep in. Carpeting can also help increase traction. Try to limit stair use and jumping on or off furniture. Pain relief - your vet may prescribe your pet medication to reduce the inflammation and provide pain relief. A natural alternatve is Boswellia extract, which acts as a natural anti-inflammatory, helping to reduce the dose of other medications and preventing potential side effects. Key nutrients - glucosamine HCL and Chondroitin are essential for maintaining healthy joints, ligaments, tendons, cartilage and synovial fluid. Visit your vet - regular vet visits ensure your pet’s condition can be monitored frequently and the best up-to-date advice can be given. Ensure you follow your vet's advice. Alternative therapies - consider other therapies such as physiotherapy and hydrotherapy to increase circulation and mobility. Take advantage of nutravet joint products - nutraquin+ is a fast acting joint support product containing the highest quality, purest ingredients and with the added advantages of Boswellia. You could also consider using nutramed, which has been specifically formulated to support an animal’s natural systems that control inflammation and provide multimodal support for joints, soft tissues and liver function, which makes it especially useful for older pets.